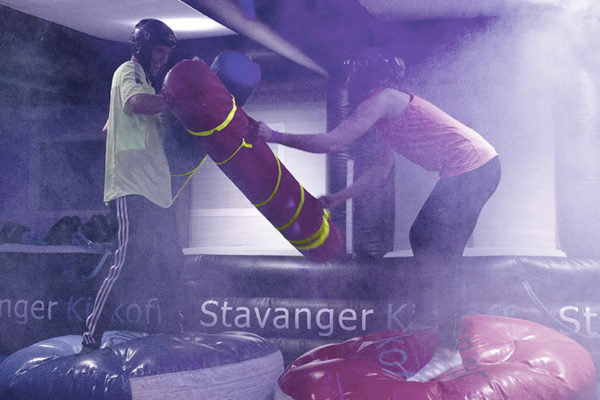 We are proud to present the greatest activity menu in Rogaland. We can provide over 60 different activities. Below you can find a summary of our activities. The equipment is top quality and best controlled in the market. All activities can be rented out to private or business customers. Please contact us for booking or noncommittal question. 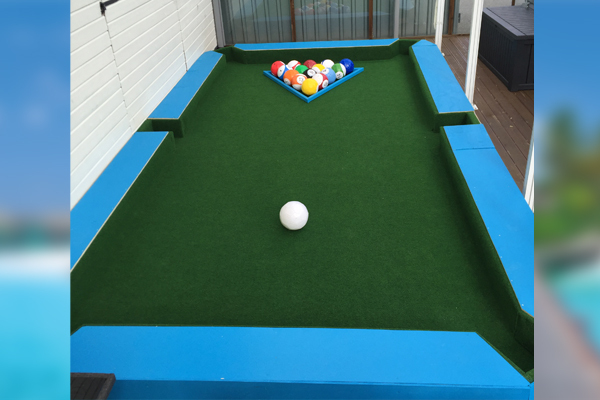 Football + Billiards = Football Pool! We play billiards, but with footballs. 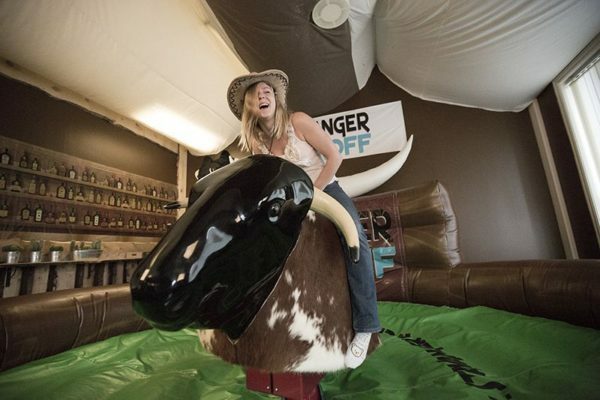 The rodeo bull is one of our most popular activities! Hold on tight and ride the wild bull like a real cowboy as long as possible. The bull starts gently but it soon becomes more difficult to hold onto. 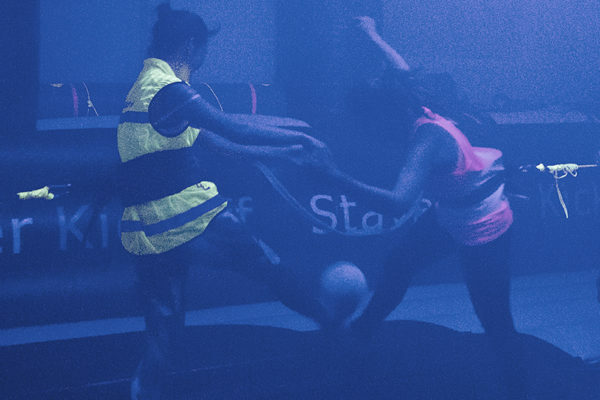 This activity is a hit on all events (the simulator used is listed as the best on the market and approved by the Park and funfair Authority in 2016). See a video. 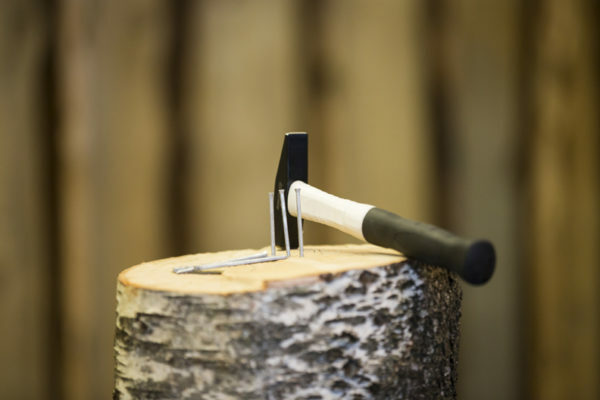 Hit the target with the ax! This activity requires good precision and a sharpe view to get full points. Here you really have to prove a steady hand. 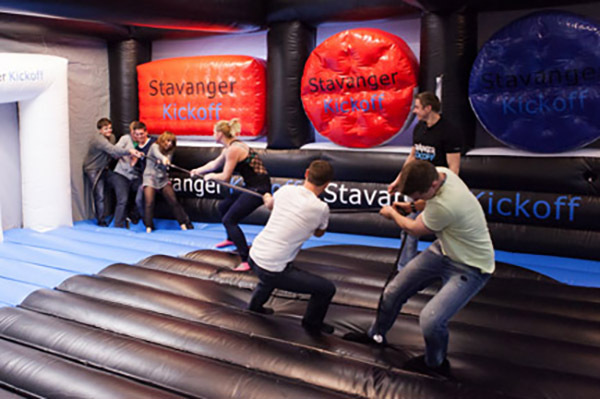 An activity perfectly suited for a teambuilding or bachelorparty. Age limit 18 years. Aim and hold your breath while trying to shot the arrows on point. Good attitude and good aim are needed to be the tonight’s winner. We provide our own bows for children and the best available on the market for adults. Here’s another real Cowboy activity. Throw a lasso and catch the bull’s horns. It’s not as easy as it looks. Perfectly suited for a cowboy party or for renting out. Who can hit the target? This is a tough activity where you get tested how accurate your shooting skills are. 18+. Our instructor is mentioned to hold 3 times the World championship and is able to carry linedance courses with or without showacts in our Wild West Saloon facilities. Courses can also be carried out at the premises. 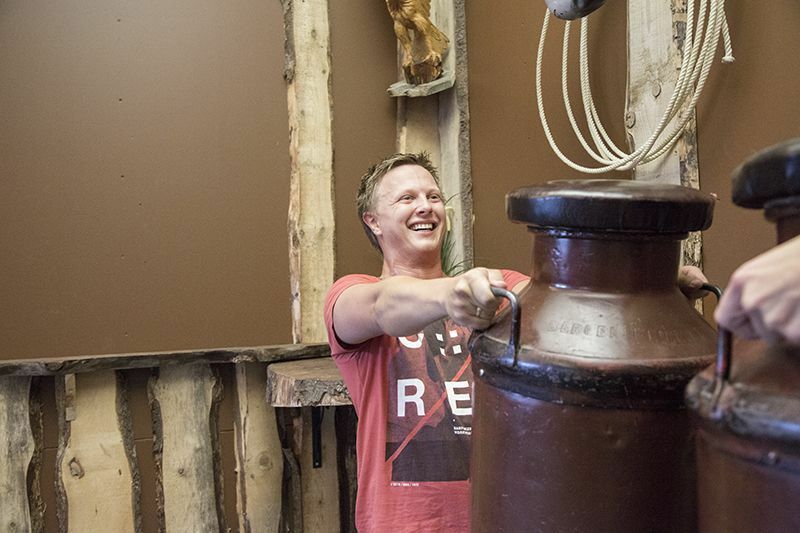 The aim of milkcan holding is to keep the can in an angle of 90 degrees to your body as long as possible. By taking your times with a stopwatch we are able to select the winner. This can be done one by one or in a competition two verus two. Who is the best one on the nail head and can pin the nail fully quickest? Exciting competition for young and old. Cactus limbo is a fun and popular activity. Bend your body but not down on your knees. Soft joints give a big advantage to be the tonight smoothest. 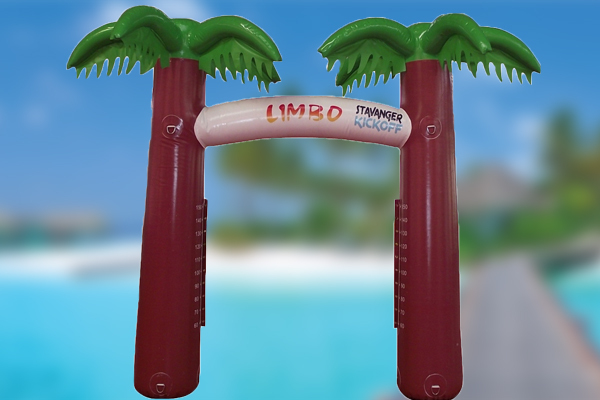 Limbo is always a winner at the party and an activity everyone can participate at. Hilarious on teambuldings, bachelorparties or birthdays. Who can hit the bulls? This is a tough activity where you get tested how accurate your shooting skills are. 18+. Quick draw is also known as the revolver duel! Who can survive and who fails? 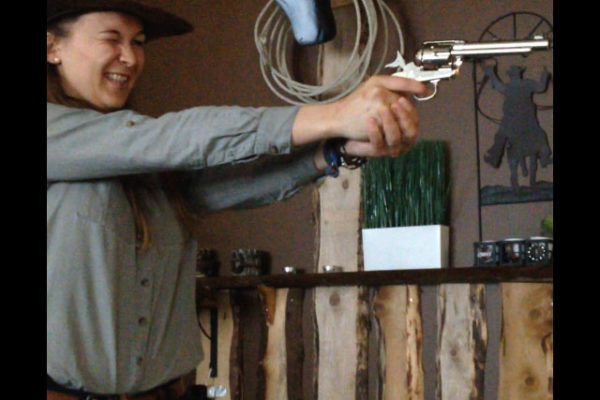 Our revolvers come along with sensors responding with sound and light effects if you get shot. Is not only about being quickest on the trigger, but also to aim properly. Two persons are competing against each other, three hits and you are tonights cowboy. 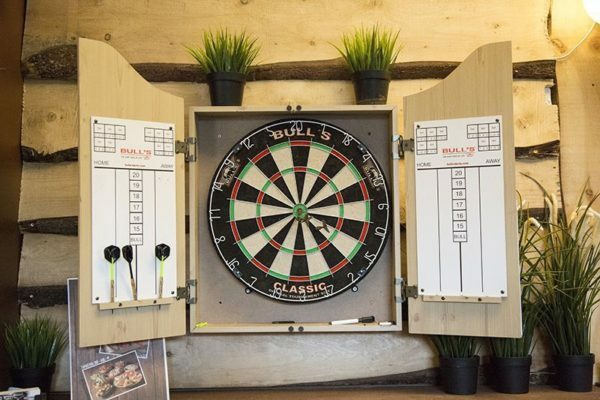 Darts is a classic and popular game which can be found in our cowboy lounge. Who is able to hit “the bulls eye”? 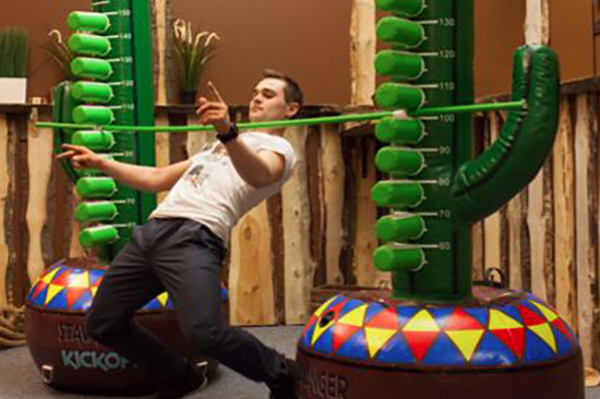 We also play killer darts, where there is no time to get a better score than one participant before you. If you cannot challenge you lose a life. 3 lives per person. 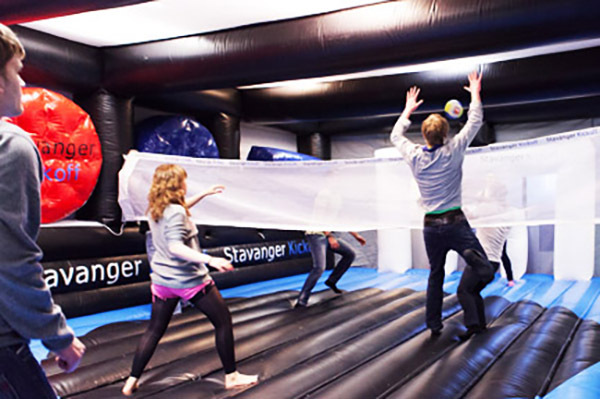 Our multisport arena is a giant inflatable sports hall containing more than 25 different activities. 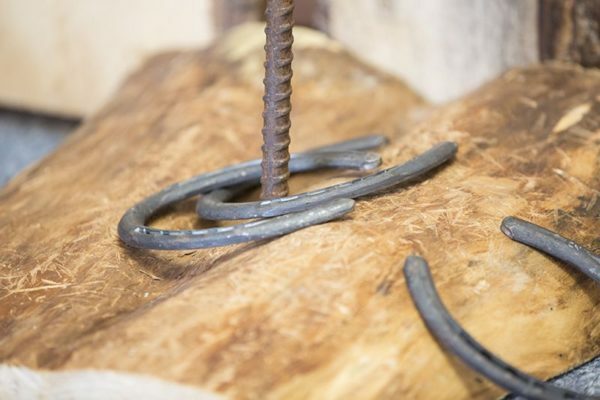 The arena is customized and can only be found in our product range. The activities are most exciting and perfectly suited to both, large and small. It includes everything from teamwork to competitions one versus one. Take a look at the different activities. Push your enemy down on the ground with special fighter sticks 3 times and you’re the gladiator champion. Good balance can be a big advantage. 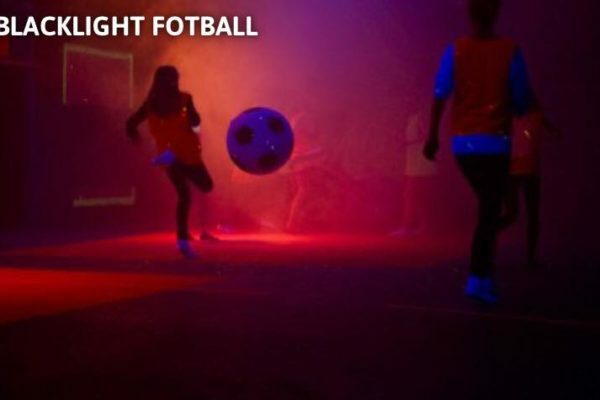 Football gets a new dimension when its played on a giant inflatable field with disco lights and sound effects. 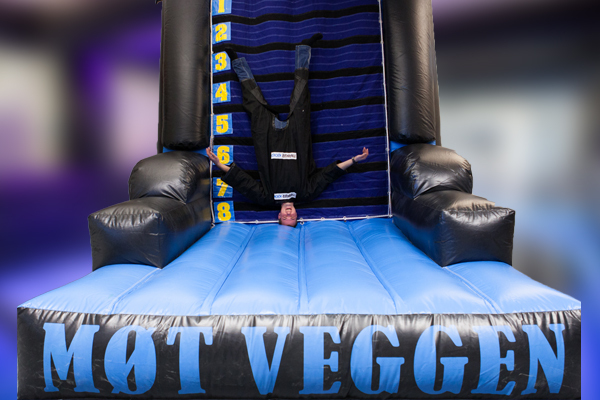 Have you ever bungee jumed? 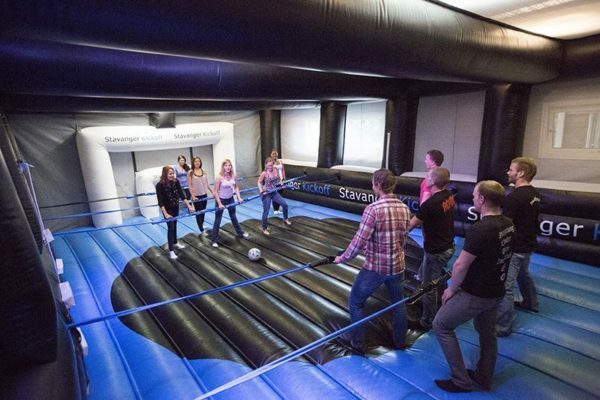 This game is not only football within a special atmosphere, it comes along with bungee ropes. The challenge is that the elastic ropes pull you back if you run too far. Great fun and challenging. Have you ever played basketball in the dark? 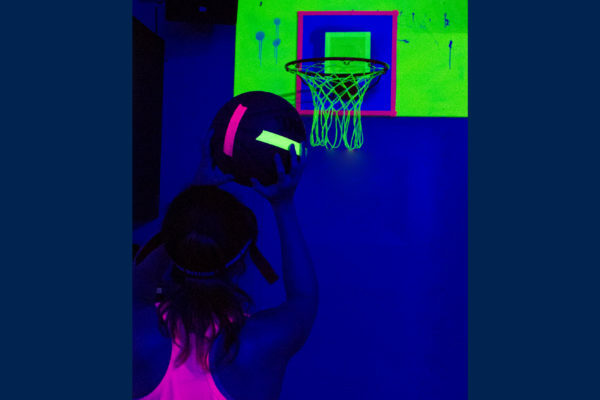 We offer blacklight basketball with sound, light and smoke effects. 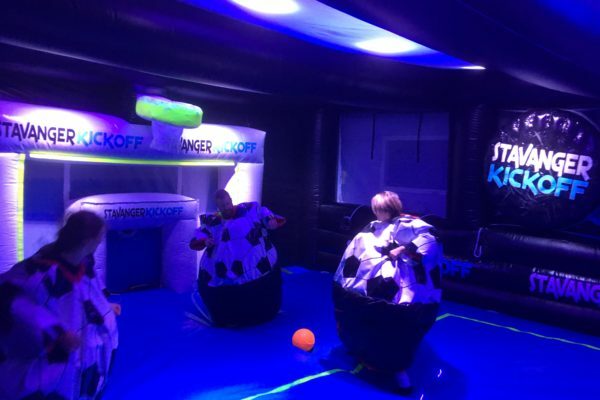 Inspired by the well known game table football, there is the opportunity for up to 18 people, 9 persons in each team, to become a player of table football. You are 3 people in one row, holding on to a rope and all three must work together to be able to move around to score goals. A very exciting activitiy that suits everyone. If you think basketball is to easy, try bungee basketball. The challenge is that the elastic ropes pull you back if you run too far. Promille football is playing soccer, but with drink glasses. These simulate that you have 1.5 promille. This is a fun and mindbending match. Own price 150, – kr pp. 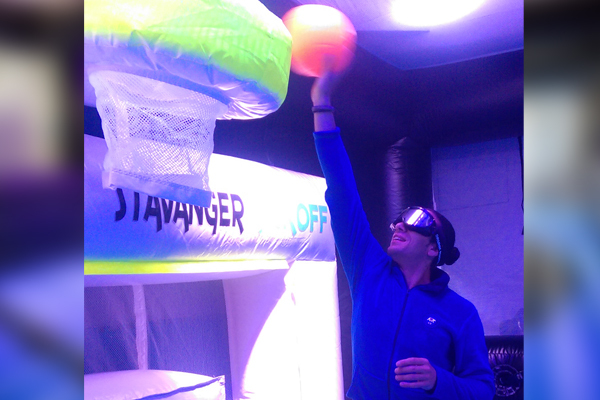 You can also try to play hockey with drink glasses in our multisport arena. Own price 150, – kr pp. When you least expect it, another participant hits you a shock. We recommend to have one group playing and the other group controlling the consoles for shocking. How much can you bear? 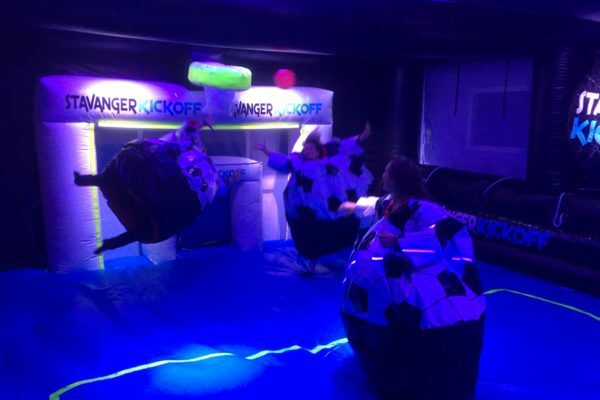 Do it as your Golden Goal and try electroshock football for a good laugh. Age limit 18 years. You may have seen it on Golden Goal? 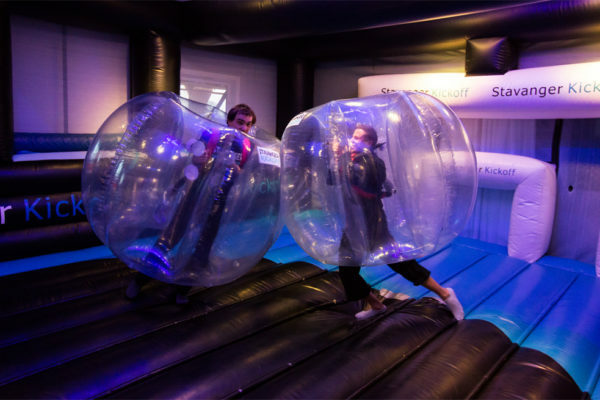 When playing bubble football, the player is inside a “bubble” and plays football as well as possible. Great fun to play as well to watch! 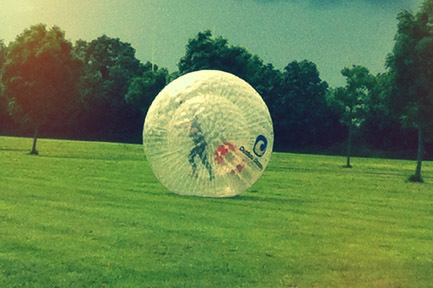 We offer bubble football outside when weather permits it, otherwise we play it inside our Multisport Arena. 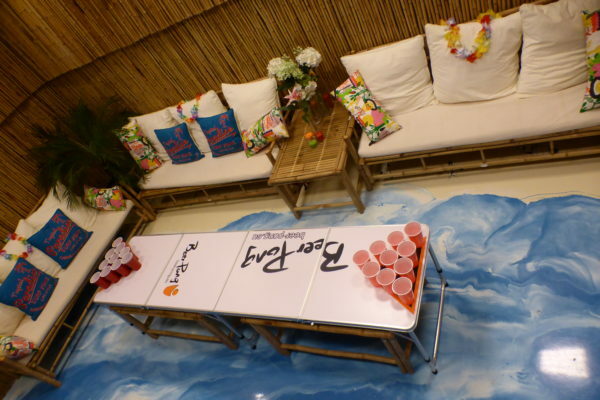 A super fun activity for both bachelorparties and teambuildings, or maybe you want to challenge a group of friends? * Delivered in our multisport or rent to other courts. Who is the strongest? Rope Pulling challenges your strenghts and teamwork, latest there was a great deal of interest. The whole team challenges the keeper. The number of goals made get counted. It is a good possibility to train your condition as well as challenging for the goalkeepers skills. Soft landing makes it easier to fling themselves. Volleyball is a sport many persons enjoy. 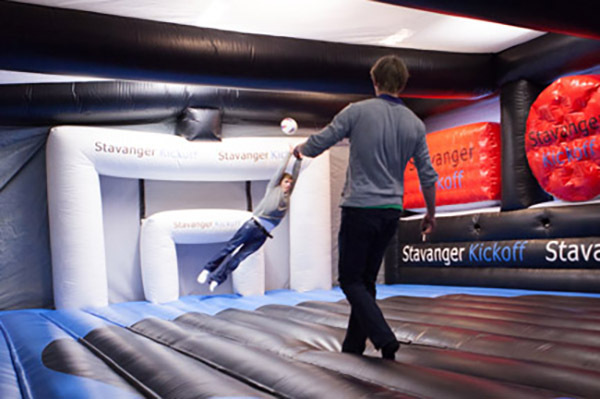 Inside our Multisport Arena, you get extra bounce through the inflatable floor, so you come up high to hit the ball over the net. Try volleyball in a new fun and exciting way. 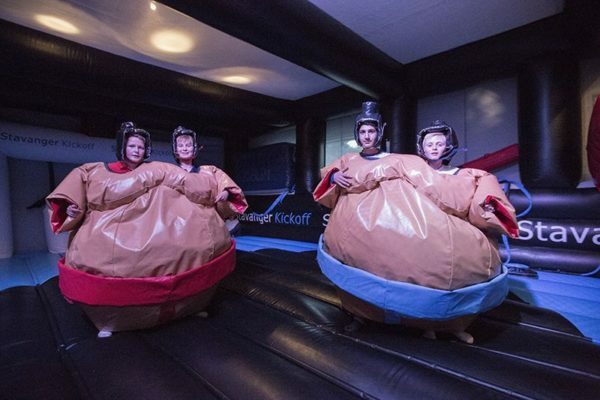 Push your enemy onto the ground or out off the ring 3 times and you are a sumo wrestler, but while waering a giant sumo suit with a helmet. This is training for laughter muscles, for participants and those watching. 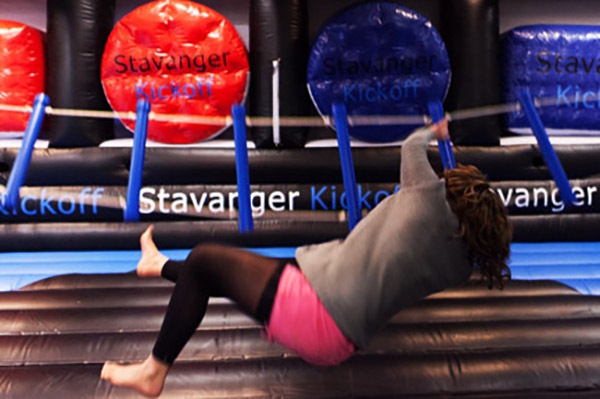 We can also provide sumo basketball and sumo football. 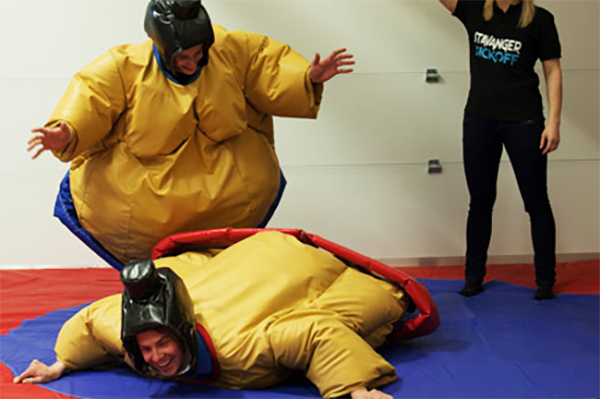 Giant double sumo suits are twice as fun and hard as usual sumo. This is good training for your teamwork, coordination and balance skills. Great fun! This is a very tough challenge to the pleasure of all participants. Giant gloves weight 3 kg, which makes it extra hard to knockout the opponent. We count the points and make sure it is fair play and good security. Bouncy Boxing. Want the activitiy? We rent such mall / stand etc. 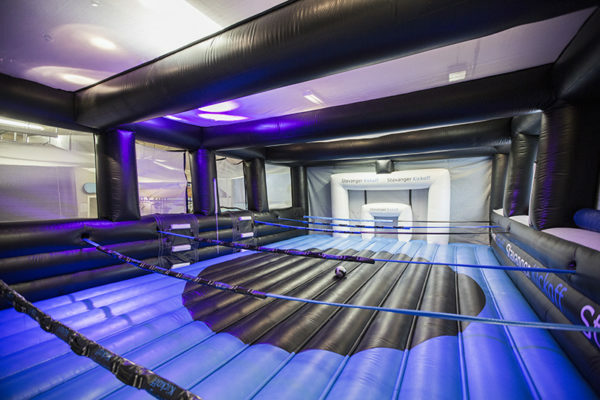 Sumo arena and inflatable boxing ring. 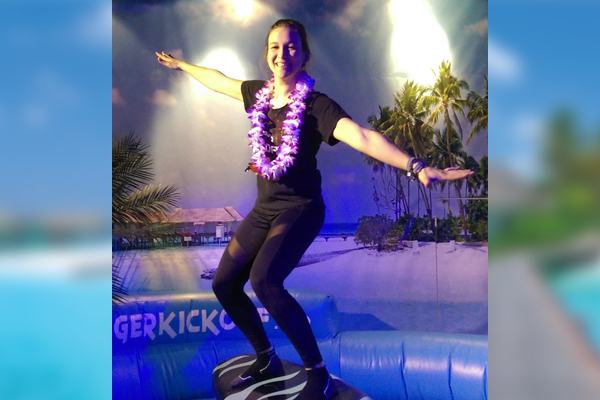 Test your balance on our surf simulator in the hawaii corner. Keep your balance as we turn up the pace slowly but surely. Who can balance the longest without falling into the ocean. The surroundings will take you to Hawaii with bamboo bars, huge aquarium with sharks and a big picture of Hawaii. This activity is very exciting and unique. Sport radar measures the speed of your shot. Test your preferred foot! 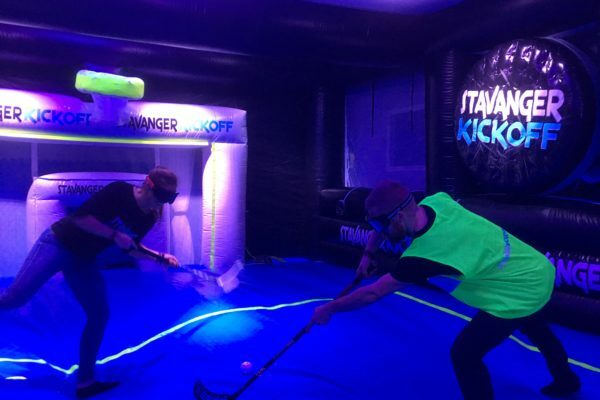 This is perfect for sports teams, businesses, bachelorparties as well as birthdays that will compete for the best or fastest shot. 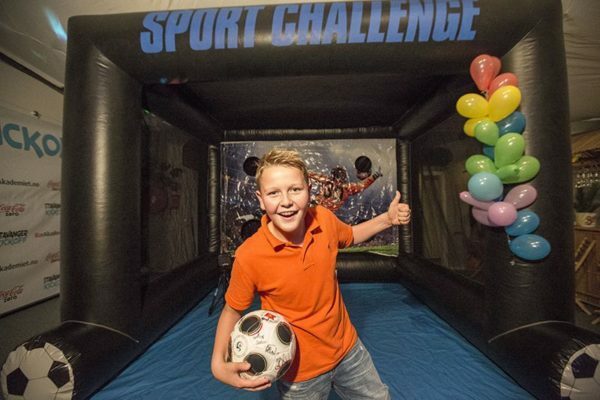 Sport-radar challenges competition spirit in children and adults. Sports teams such as soccer, basketball, golf, baseball and other ball games can order an annual test, in connection with the seasonal shutdown or start of the season. This motivates the whole team to train more. We can provide a result list if desired. 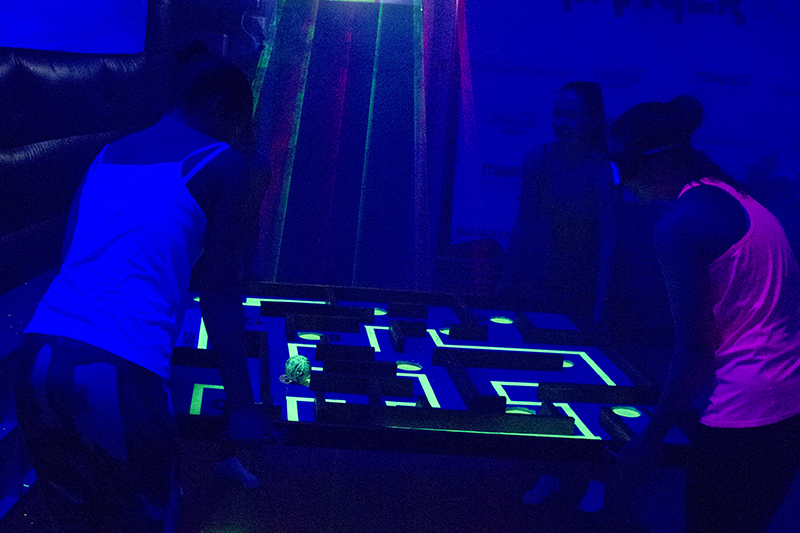 We’ve adjusted some cool changes on our mega maze so that it can now also be used with our blacklight concept. 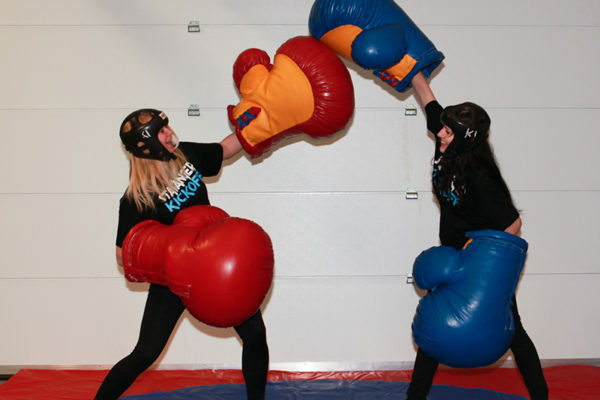 This activity is originally inspired by the TV program “Hvem kan slå Aamodt og Kjus” (Who can beat Aamodt and Kjus?). One should get the ball through the maze in the fastest possible time, but take care for the wholes. This becomes even more challenging when the lights are turned off and only lighting effects are on. Here it’s all about concentration and teamwork. Work together as a team with communication, active listening, cooperation and trust. 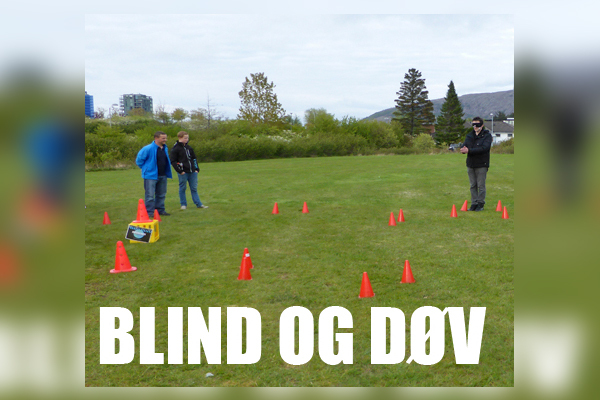 The deaf leads the blind through an activity trail with difficult challenges. Fireman Ladder is also called Jacobs Ladder. This is a challenging and fun exercise with a lenght of 10 meters, starting from 50 cm to 3 meters height. Land softly! We count points for every step you manage to climb. Everybody knows regular bowling, but here you can play bowling with a football. You must kick the ball and hit as many cones as possible. This is a great activity for all sorts of events. 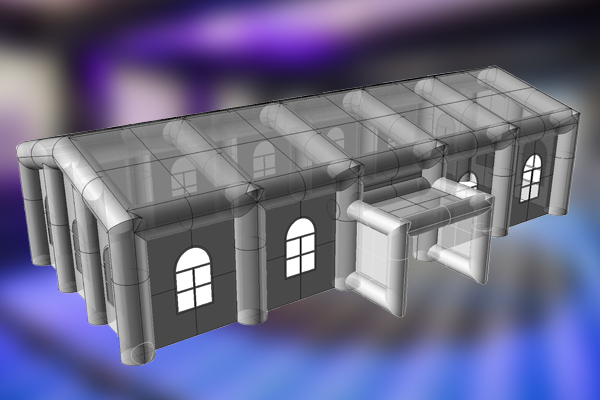 You can also play crazy bowling at the same venue. This activity fits perfectly for everyone. Here teamwork is the focus with 3 or 6 people coordinating arm and leg simultaneously on one pair “big feet”. Aim is to be first to the finish line. 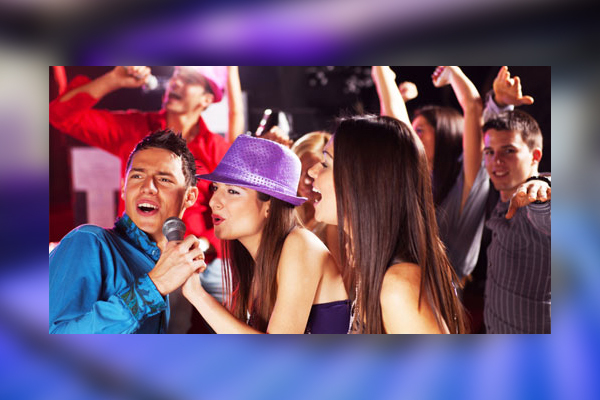 Karaoke is a very fun activity for teambuildings or bachelorparties. Feeling like 1.5 or 2.5 promille but without the use of alcohol is possible with our promille glasses. With these on you lose your balance and it becomes extra challenging coordinating your body. We use glasses to raise awareness, but also to make fun with contests such as mega maze. Trilling pants that are sewn together pants. 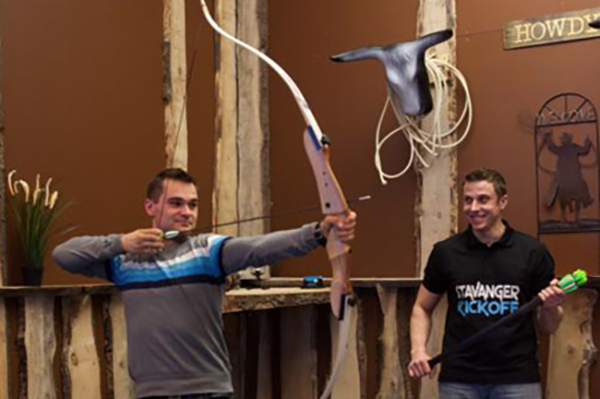 This activity is great for your next bachelorparty or teambuilding. The focus is on teamwork, as 3 persons need to coordinate simultaneously. Winners are the first to the finish. 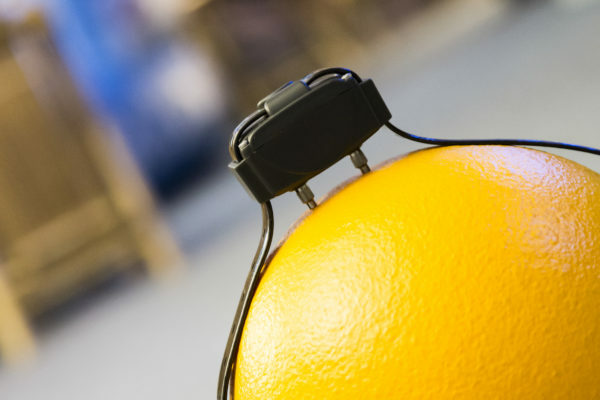 We use electroshock for various activities. We challenge participants to sing, draw, dance or carry out any of our activities while they are wearing a stun ties. 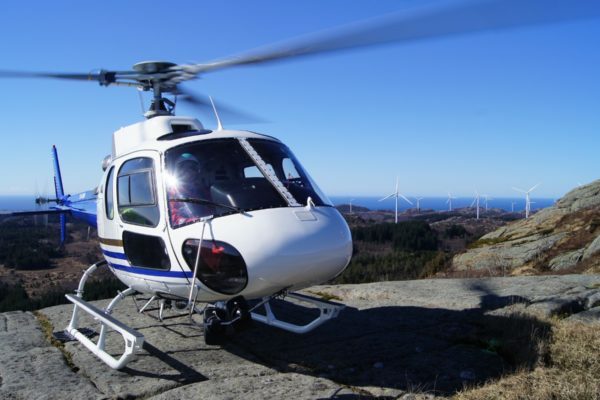 The equipment can be adjusted with shock levels between 1 – 5. Extremely fun to watch, but also fun to attend. 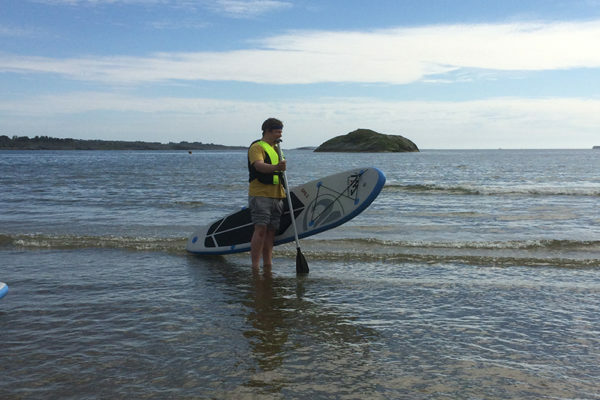 Should you book this activity, make sure all participants are medically able to carry out the activity. Ask us for more information. Age limit 18 years. Face the wall for an incredibly fun and challenging way you will not forget. You get you a velcro suit to stick to the wall. It applies to jump as high as possible and get stuck. 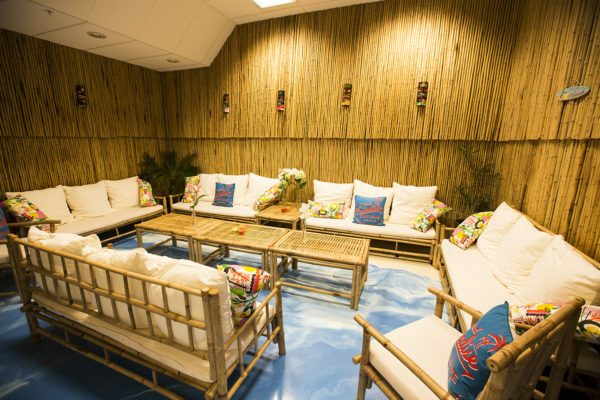 Our VIP – Hawaii Lounge is quite unique and designed by us. The entire room is designed to give you the impresssion staying in exotic surroundings, with even the floor looking like the sea. Come and relax in this amazing lounge. We can offer good food and drinks, as well as interesting little activities. 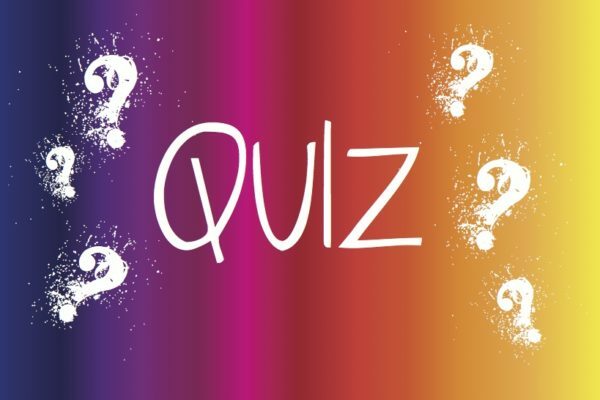 We offer all kinds of quizzes for various events. 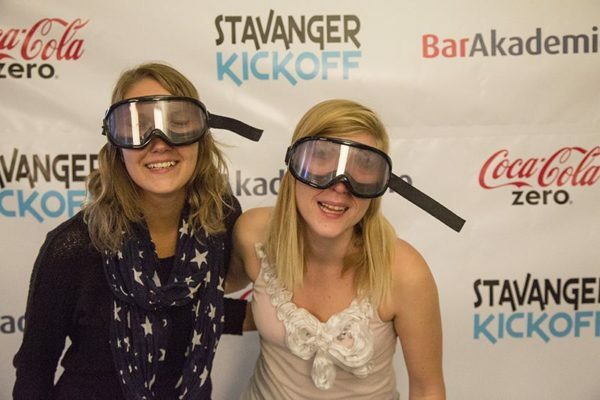 Add an exciting quiz package with activities, food and drink for your complete teambuilding or bachelorparty! Note: Amazing Race team building package contains quiz. Your group gets the challenge to take the most creative position. We make this a fun task and recommend to show these images during dinner entertainment, or awards ceremony. 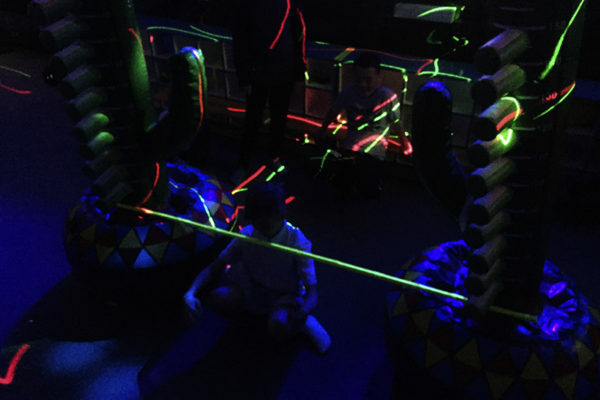 We offer blacklight activities with sound, light and smoke effects. A game that combines the folk sports pingpong and drinking beer in an exemplary manner. It’s all about getting pingpong balls to fall into the enemies cups and thus get your opponent to drink. For two players or two teams. The easiest solution is often the best solution. Dance under our Hawaii limbo. How low can you go? Festive activity to all kind of parties. 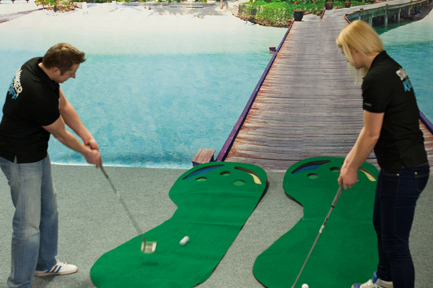 Have you ever played golf in Hawaii? Here you have the option! Compete 2 vs 2! Who is today’s winner? Who can manage the impossible? Hit a golf ball up in a basket? This is a fun but very challenging activity. Here you should have good patience and a steady hand. Hit the ball into the hole using the least amount of tries. It requires concentration and good precision. The maximum number of strokes on a path is 7. 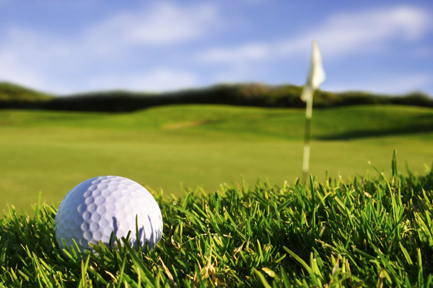 If the ball jumps out of the path lay it back in the field where it went out. Fun and traditional activity impinging at most. 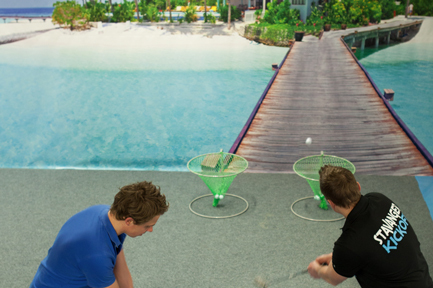 Sport radar measures the speed, come and test your golf swing! This is perfect for sports teams, businesses, bachelor parties or birthdays. Sport radar challenges competition spirit in children and adults of all ages. 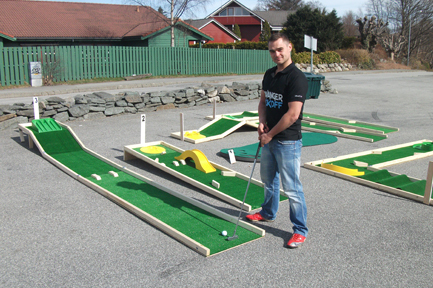 Perfect for sport teams engaged in golf. This motivates the whole team to train more. We produce results if desired. 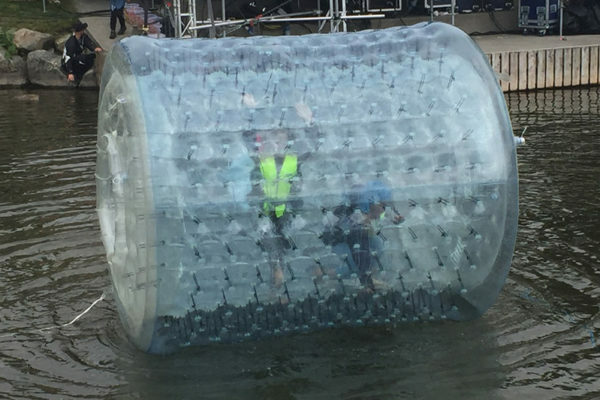 You get into the ball with a zipper, wearing a lifejacket. 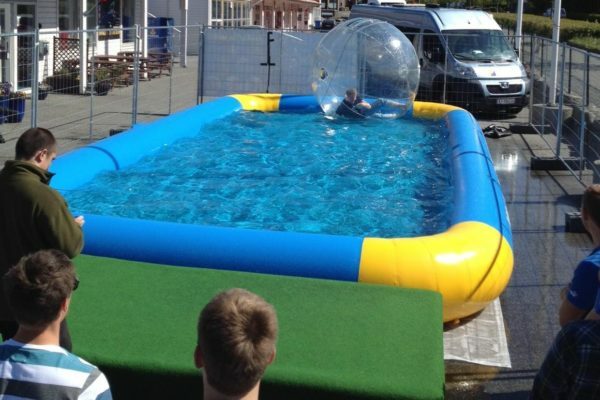 The ball is filled up with air and you get thrown in the water. The fastest to finish a predefined distance wins. A rope is attached to the ball and land, to make sure you always come back. We arrange a competition and take your time, the fastest one finishing a predefined distance is the winner (for example Stavanger harbor or Hinna Park). Mass audience? Fun to try and incredibly fun to watch. 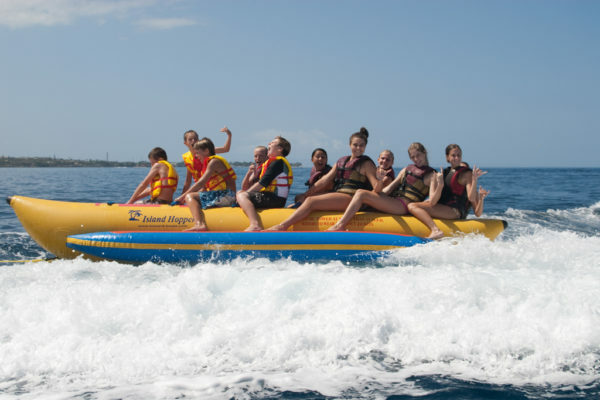 Banana boat can give a ride to 10 people at a time. Activity location is Hinna Park, contact us for a different location. 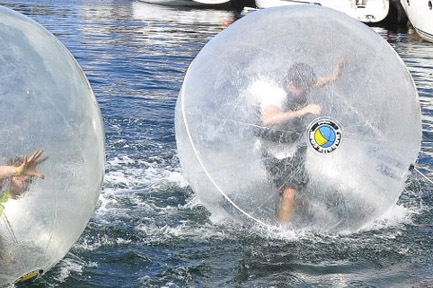 Flyfish is an incredibly fun and exciting water activity. 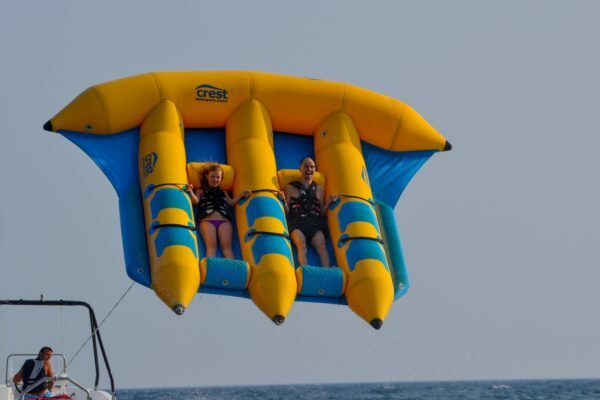 You are in the flyfish connected to a boat, being lifted into the air. Are you ready to fly? 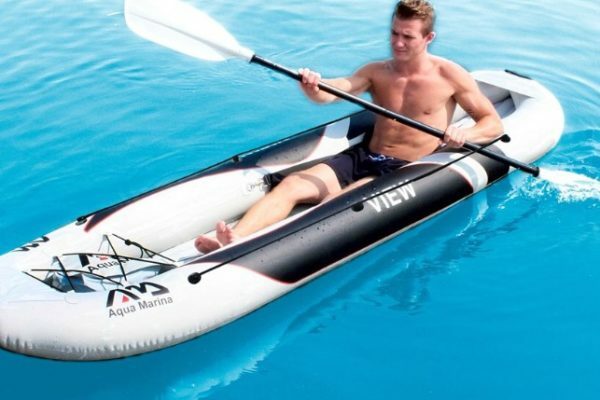 We offer inflatable canoes for rent. We usually use the water pool for Runnerz or water ball. But you can also ask us if you want to hire it. (10m x 5m). Facing a tough and fun bootcamp? Test your power in our real bootcamp style Army Challenge! 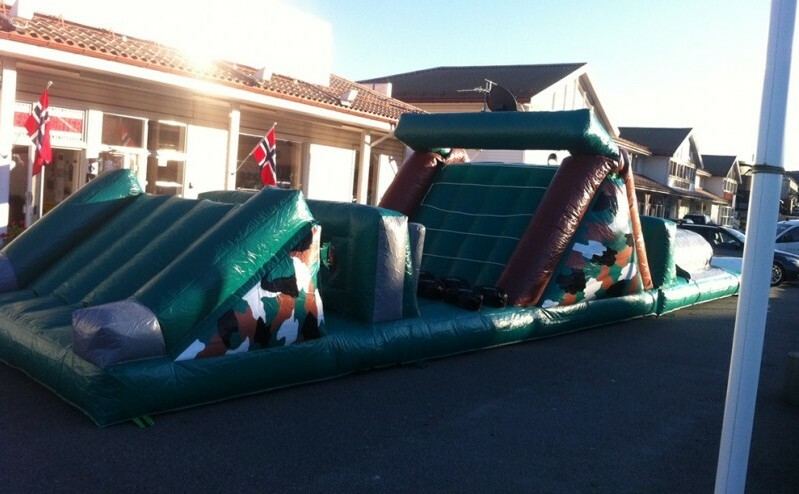 This is a giant inflatable and military obstacle course with an entire lenght of 17-34 meters, 4 meters wide and 3 meters high. Who can finish the fastest? You can have teams or single battles. We hold the opportunity to expand our venue by 160 m2. The party tent measures 18 meters in length and is 8 meters wide and as much as 5 meters high, as well as a special entrance. 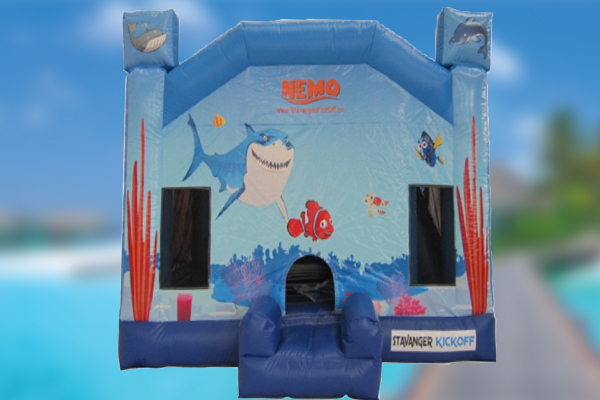 We also offer rentals for party tents. 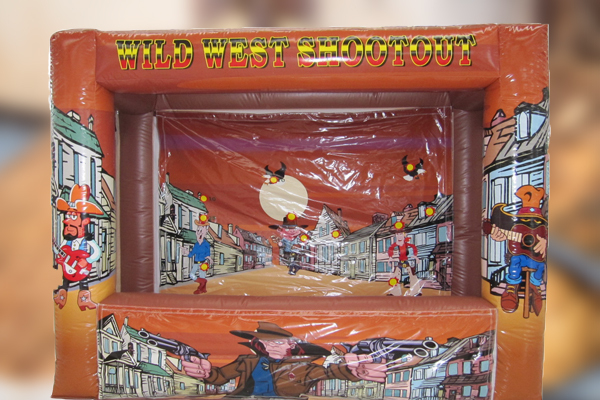 Wild West Shoot Out is about to hit the targets with a unique and fun piste with velcro balls that attach to the wall. 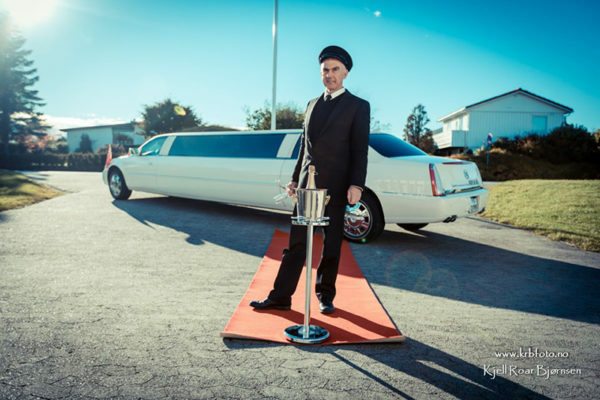 We offer all kinds of transportation – please contact us for more information. 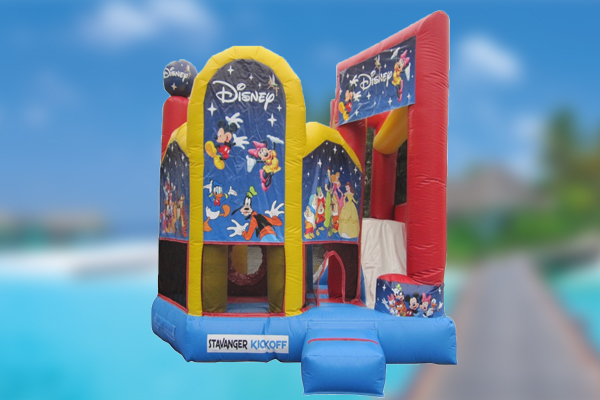 We provide a disney bouncing castle including a climbing wall, slide, basketball and more challenging specials. This boucing castle is our smallest and weights 123 kg. It measures 4 meters in lenght and is 4 meters wide. The height amounts to 4.6 meters high. 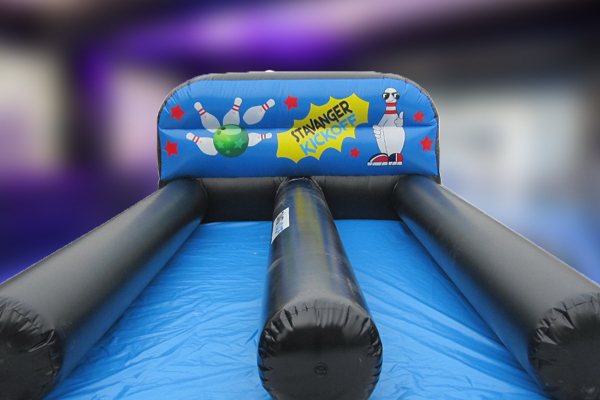 It is often rented out for events holding a Disney theme, shopping centers or other children arrangements. 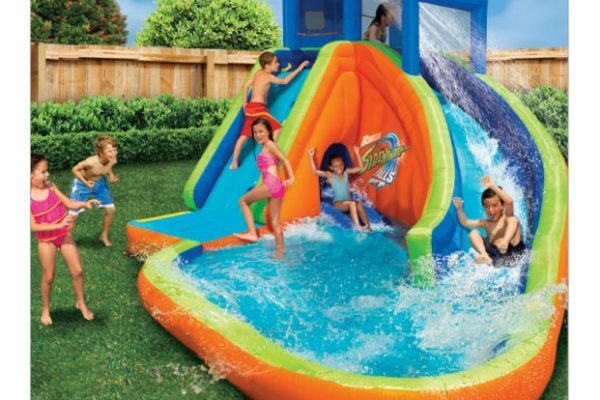 If you do not have a large property but want one inflatable, this is the one to get. 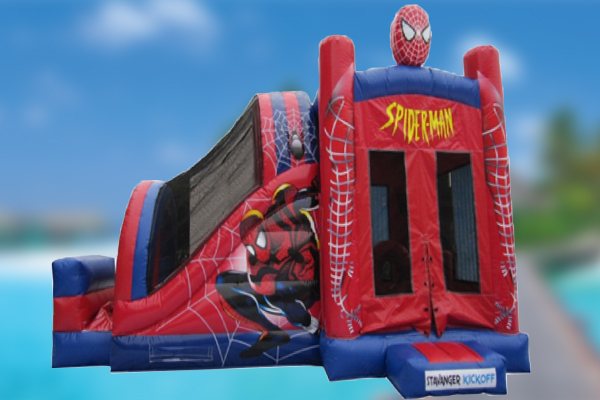 Spiderman is just one more of our fantastic bouncing castles. This castle includes a climbing wall, a slide, basketball and hilarious obstacles.It weights 186 kg and is 8 meters long, 4 m wide and 4,6m high. Contact us for more information.